A 230 page Nutritional Self-Help Cook Book with gourmet level recipes. There are 80 pages on Nutrition and a 400 item Nutritional Index to reference health issues that you or your loved ones may be facing. Find remarkable healing support through mineral and fiber rich foods that are used in the Scrumptious Recipes. For a glowing youthful face, a healthy strong body, and a calm mind. Enjoy the 54 Raw and Raw Vegan (made without animal products) recipes and 54 cooked recipes all gluten free, dairy free, sugar and soy free, foul and red meat free. This diet, which Kathleen calls, "My diet" has proven to relieve allergy symptoms and food sensitivities, boost your immune system, diminish arthritis pain, helps to prevent inflammatory disease like cancer, PMS and much more. A book for those who want to attain glowing health, those with dietary needs, food restrictions and those who want to become more knowledgeable of Self Healing. 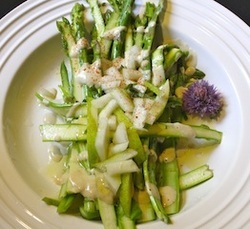 We have seen remarkable results using these recipes and Kathleen's super foods recipes along with her extensive herbal, nutritional and detoxification knowledge on our Detox Retreat Vacations. Our participants have lost a pond a day, lifted depression in 3 days, healed arthritis pain in 4 days, shrunk tumors and lifted chronic fatigue in 7 days, all while having the time of their lives! See the Retreat/workshop tab or email corelevelhealing@gmail.com for more info on our monthly Detox Retreats and join us today! Niagara Falls, NY and Canada, New Hope, PA, Big Island of Hawaii, Estes Park, CO, Santa Barbara, CA, Greenport, Long Island, NY, West Palm Beach, Florida. Enjoy the very best of foods and stay healthy and fit! "Healthy is Delicious" Ebook cost is $25.00 and Printed book is $48.00 plus tax, shipping and handling. 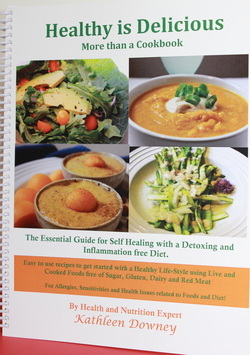 If you'd like to buy this wonderful guide to Self-Healing through food and would like to try these delicious recipes that I've worked with and perfected over 20 years. Please email me at corelevelhealing@gmail.com or call 858.401.3144. Also see shopping cart for credit card purchases online. With Gratitude for allowing me to help you to be and stay healthy without sacrificing taste! A 230 page Self-Healing Cook Book with 54 Live Vegan gluten and sugar free Recipes and 54 Cooked gluten, sugar and dairy free recipes and 80 page nutrition guide with a reference index to 400 health benefits. Please call 858.401.3144 or email corelevelhealing@gmail.com to order! Please join us for a Free Nutritional Advice on Boosting Energy levels with Food and demonstration of a raw and cooked dish! 1 or 2 Week Long Detox Retreats in Niagara Falls, NY and Canada, Estes Park, CO, New Hope, PA, Florida, Santa Barbara, CA and Hawaiian Paradise! Benefit from Kathleen's 38 years of research and experience with the healing benefits of Nutrition. Kathleen started to eliminate Red meat, gluten and dairy from the time she was a teenager when she started to realize that these foods made her feel bloated and left her fatigued. She stopped soy after using the alternative to dairy for a short time 25 years ago after realizing it left a strange taste in her mouth and made her stomach ache shortly after ingesting. The rest of the world is finally catching up to her as more and more research has uncovered the problems these foods cause. Sign up now to be part of this wonderful trip to the Sacred lands of Niagara. Niagara Falls area has one of the most potent energy vortexes in the world. Explore the magnificent Rocky Mountain National Park for hiking, fresh air and wild life spotting as you detoxify your organs and change your life! Estes Park is like another world, one you want to be a part of. Don't miss these opportunities if you really want to get healthy! Participants in 2014 called the Hawaiian Detox Retreats, "the time of their lives! One of the first steps on the path to healing our bodies and minds is changing our diets to support organ function for a healthy body, mind and spirit. Food is our fuel. We can't put low grade fuel into our cars and expect them to work well when they need a higher octane, same with our bodies. Feeding ourselves with nutritionally rich, unprocessed foods helps our bodies in many significant ways, which my book will help you to understand. The health of our bodies and our minds effect all that we are and all we do, it is the most important aspect of our lives therefore we must treat ourselves with care and consciousness in all we do, all we ingest. In order to function at our full potential, think clearly and have energy our food must be the highest quality, grown organically without pesticides, not genetically modified or altered, nothing that has processed sugar, corn syrup, aspartame or any ingredients that sounds like a science project. Always buy fresh organic or local pesticide free produce, unprocessed grains, and wild caught fish as often as possible or eat the seasonal fruits and vegetables from your own garden! Millions of us have discovered that we have food allergies, it's a problem that plagues people everywhere. Studies have shown that one of the reasons for depression, headaches, ringing in the ears, hyperactivity, abrupt changes in personality, diabetes, CFS, even autism is food allergies. The major ingredients that cause allergies are the foods we've mostly been raised on and have eaten daily - dairy, sugar, soy, wheat and corn. These products are in so many of the foods we've had since childhood that we've over-loaded our systems with them. They are difficult to digest and cause mucous build up, which is known to be one of the contributing factors in the development of arthritis, and a myriad of other health issues including candida ablicans and diabetes. The thought of not eating favorite creamy dairy, sugar and wheat products or meat dishes may be devastating to some of you. Not any more! The amazingly delicious raw recipes in Healthy is Delicious are all vegan and grain free, (grains have been reported to cause mucous - if you have inflammation you may want to cut back or eliminate) dairy free, wheat and gluten free, meat free, sugar free and soy free. They are easy to make and are packed full of the enzymes our bodies need to support the breaking down of proteins that free our bodies from allergies, debilitating arthritis and illness. Nutrient, enzymes and antioxidants our bodies need to help us overcome allergies and other health challenges are available in organic raw or live foods. Enjoy renewed energy, a healthy body and mind with delicious whole live foods. Some of you may want to add a percentage of cooked vegan foods to your raw diet and even an occasional meal with fish for the healthy omega's they offer our brains. It's important to live in balance with food and nature. If you are unsure about the best dietary route to take please call or email me for a dietary Counseling session or a Shamanic Counseling session. It is very important to have the will power and the tools and info necessary to shift your diet and stick to it. When we endeavor to accomplish a healthier lifestyle we should always include emotional/practical support. A new diet or eliminating mucous and inflammation producing foods like dairy and gluten will cause your body to detox, which will bring up old emotions. The emotional support I offer will help you to understand what your mind and body need to maintain a healthy balance.